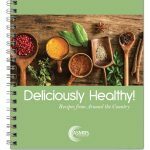 For a complete list of products download and print this order form. Instructions for submitting an order are included within the order form. Contact us if you have any questions or need assistance. 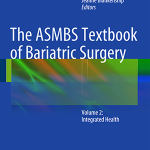 The ASMBS Two-Volume Textbook features chapters written by experts in the field and edited by ASMBS Leadership. U.S. ORDERS ONLY. Please contact us directly for international orders and shipping details. Online orders are limited to five or fewer posters. 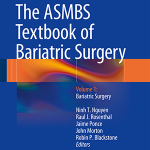 For larger orders, download and complete a printed order form and email it to info@asmbs.org. This poster is specifically designed for use in the care of the Bariatric Surgery Patient. 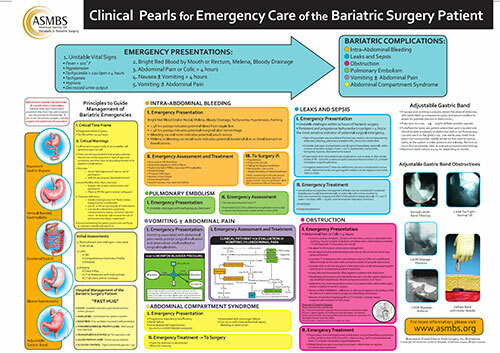 It was created with a “flow chart” design for the purpose of assisting the Emergency Room Doctor in diagnosing and caring for complications which may be encountered with regard to the Bariatric Surgery Patient.This poster is provided FREE of charge from The American Society for Metabolic and Bariatric Surgery as a “download” from this site. The download is in PDF format and can be reprinted as a poster by the printer of your choice. You may also purchase a 30″x40″, 20″x24″ or 16″x20″ wall poster to have conveniently displayed in the Emergency Room. Enter the information below for where would like your product(s) shipped. Please agree and check both items to proceed to checkout. I agree to have this order shipped to the address indicated above. I agree to the price above, please send me to checkout. Thank you for supporting ASMBS with your purchase.